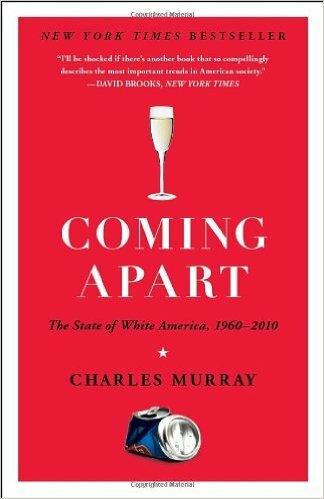 A Book Review: Coming Apart: The State of White America, 1960-2010 by Charles Murray. “If you only read one book this year….” is the sort of thing that one sees at the beginning of a review of a momentous book, so that phrase is rightly placed here. You will do yourself a favor if you read this book this year – or at any time. The Baby Boomers who came up during the period under Mr. Murray’s examination are all acutely aware of how different America is today. And the brilliance of Murray’s approach is that he is able to succinctly but thoroughly show how the context of our lives has changed, what is now so very different and what were the causes. The first evidence of Murray’s genius is in his title. With images of Ferguson or of Baltimore fresh in our minds the temptation may be to add a racial component to any “coming apart” one might describe. But by focusing exclusively on “White America” Murray avoids even the appearance of possible racism. He further deploys extensive statistical evidence to support his conclusions which should assuage any remainder of suspicion. So the result is the description of a bifurcation of American society – that is, “white” American society. In order to paint a picture of what’s different now, Murray asks his reader to think of attending a parent’s night in an average neighborhood elementary school and then to imagine one at an “elite private elementary school.” He starts with differences in the parking lot and then describes the likely differences in the strollers used by each group and finishes with a description of the parents themselves. The latter group, while driving foreign cars and pushing high dollar strollers bought at baby boutiques are also much more slender and likely to know their cholesterol number. They will be more well informed, less likely to watch TV and please, don’t look for them in a McDonald’s! They will marry later, frequently vacation out of the country and will obsess over every aspect of their children’s lives. In short, a separation of mainstream and rich has visibly occurred. What were the causes? Murray identifies four: “the increasing market value of brains, wealth, the college sorting machine, and homogamy.” And they all work in an incestuously powerful way. Murray quotes Bill Gates as identifying the ability of “brains” to effect high value impact on a company, thereby driving up the cost of those people so gifted. This produces wealth which produces the ability of more parents to send their children to elite schools in pursuit of more “brains”. The more children attending elite schools means students of both sexes which then are more likely to marry their own kind. Murray uses statistics to show how these “brainy” marriages produce children of higher IQ’s which then, are more attractive to elite schools so the scenario repeats, ad infinitum. These “homogamous” couples are also more likely to settle into zip codes with more of their “kind” which augments the separation of the elite from the mainstream. Murray’s extensive statistical support for these phenomena is fantastic and prevents any skepticism about his conclusions. This separation would not be problematic, per se, save for two attributes of the new elite: they tend to be the new influencers in politics, business and media and they are now almost completely devoid of any knowledge of the other class; a process Murray describes as “balkanization”. Having outlined the new upper class, Murray turns his analysis to the new lower class. In order to establish a context or framework Murray reflects at some length about the qualities which allowed American to prosper since its founding and he cites four: industriousness, honesty, marriage and religion. Fascinating observations follow about how few people were on the dole, how few were in prison, how important married women are to the social fabric and how religion builds a sense of caring and community which undergirds the whole enterprise. Murray quotes at length from Tocqueville and Grund – two contemporary European observers – as well as several of America’s Founders here. Having established the framework, he then applies modern statistics to show how those four areas have deteriorated so extensively as to produce the lower class of today. But, in a fascinating bit of counterpoint, Murray underlines the fact that the new upper class still exhibits those virtues. That is, they are highly industrious, they stay out of jail, they stay married and they have exhibited a slower decline in “religiosity”. One drawback I find is Murray’s skittishness in prescribing a solution. Anyone with a basic familiarity of American history will recognize that Murray’s concept of “industriousness” used to be called the “Protestant work ethic.” And the concepts of “honesty”, “marriage” and “religion” were part and parcel of the Calvinist ideology America’s Founders held while forming this country. Even the idea of “community” grew out of the Protestant notion of the “priesthood of all believers” and the organization of society around the local church. If the “coming apart” of our current society is signified by deficiencies in these areas, surely a “coming together” would result by returning to them. Murray seems to imply that the shortcomings in these areas will magically heal themselves as Americans watch the slow suicide of Europe. Another unfortunate part of this book is the author’s swipe at the sincerity of America’s Founders, at least with regard to their religious convictions. Murray says that, “They (the Founders) went to church, but few of them were devout.” Historic psychoanalysis is always problematic. Besides, this negative focus on a mere handful of individuals obscures the broader picture that 80% of Americans at the time of the Founding were strongly influenced by the teachings of Calvin and more than 70% of the universities were founded on those principles. The focus on these men, even if the conclusion is true, also says nothing about their families which were nearly always “devout”. One might despair having come this far – and there is reasonable support for this reaction. But Murray ends on rather a high note that points to the light at the end of this tunnel. The light seems somewhat dim and at a considerable distance but Murray is not a pessimist about the outcome – at least in the long run. If you are the slightest bit interested in how our society is changing, I would highly encourage you to read this book.